Vinyl floring removal is sometime necessary. Vinyl floors are an inexpensive alternative to other kinds of materials. And, it comes in a wide variety of styles. Vinyl is manufactured to look like wood, tile, mosaic, and more styles. Although vinyl floor covering provides many choices and it’s easy to clean, it doesn’t fare well against sharp objects or even pet claws. Plus, it’s delicate when it comes to fluctuating temperatures and moisture levels. The biggest hurdle to vinyl floor removal is the labor. And, it takes a lot of work to take it up. But, it’s not technically difficult, so really just about anyone can do it. Furthermore, it doesn’t require a lot of specialty tools. However, just like linoleum flooring removal, it’s best to have a few helping hands to do the job in as little time as possible. Another consideration is what will replace the vinyl. That somewhat depends on the material and condition of the subfloor underneath. If the subfloor is in good condition, it’s possible to install tile, hardwood, engineered flooring, or carpet. But, if the subfloor isn’t in the best condition, it will need rehabilitation. 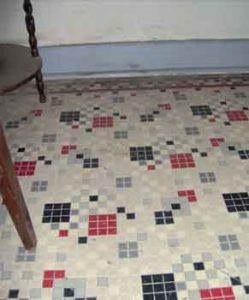 Plus, you’ll still need to decide what type of floor covering will work best. Begin in a corner. Much like removing carpet from a space, you need to start in a corner. This is where it’s easiest to grab ahold of the vinyl to pull up. If one corner is too difficult, just try another. Use pliers or another tool to grab a corner and begin to pull it away from the subfloor. But, do this will caution so you don’t damage the subfloor. Scrape off the adhesive. After the vinyl is off the subfloor, there will likely be adhesive patches about the room. Unfortunately, you can’t just leave the adhesive on the subfloor because it can cause unevenness and other problems. Use adhesive remover, following the manufacturer’s instructions carefully. Deep clean the subfloor. Once all the adhesive is removed from the subfloor, it’s time to give the subfloor a good cleaning. You can use a combination of warm water and bleach to remove any stains. Be sure to let the floor dry completely before installing a new covering. Junk the old vinyl flooring. Now the vinyl flooring is up, you can junk it. But, it’s also possible to reuse it, if it remains in good condition. You might have use for it in another location. For vinyl floor removal, phone 800-433-1094 or visit Junk Garbage Removal. Our team will take away any flooring and any construction or remodeling debris for you.